Man Sweeping Water from Parking Lot? 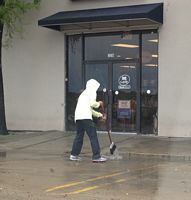 While my son was taking his driving test (he passed, thank God), I watched this man sweeping water. Yes, that is correct, and fortunately I have the picture to prove it. Most of the time he was smart enough to stand on the sidewalk at least, instead of standing in the water as he was before we left – as shown here. He would stare intently at something in the water for a while. Then he would start sweeping as if he was trying to get the water to the higher part of the parking lot. Quite obviously, each time the ripples ceased, the water returned to its original position. Other than trying to sweep the water away (futile though it was), anyone else have a clue or guess as to what he was doing?